This quick and simple mono-printing project uses tempera paint, cookie sheets, and card stock (or any other paper) to create beautiful abstract paintings. Place your cookie sheet on the table in front of your little artist. Drop paint on the cookie sheet directly from the bottle. One or two drops of each color is more than enough. *Remember to limit your palette to no more than three colors. Encourage your child to play with the paint on the cookie sheet. They can push it with their fingers, blend it using cotton balls, make lines using Q-tips, blend colors, make dots, etc. After your little artist has played with the paint for a few minutes, and has created interesting lines, dots, blends, etc. take the white paper and lay it on the cookie sheet, covering as much of the paint as possible. Ask your child to help you press the paper down then rub your hands over the entire piece of paper until it is flat and has covered most of the paint on the cookie sheet. Now it is time to “pull the print.” Hold onto one corner of the paper and pull it away from the cookie sheet. *Revealing the painting that has been created while pressing the paper onto the cookie sheet is one of the most exciting moments of this project. There is often enough paint on the tray to pull multiple prints. Once you have pulled the first print, simply lay another sheet of paper down on the remaining paint, smooth it out and pull away. After you have pulled the first rounds of prints, clean the cookie sheet, drop new colors of paint and continue! To get the most aesthetically pleasing pieces, keep a close eye on your little artist’s progress. You’ll want to pull the print before the colors become too muddled. A little bit of mixing is fantastic, but too much mixing will give you a print that is brown and boring. It may take a few rounds to find the perfect moment to pull the print. For an additional sensory component, chill your paints in the refrigerator over night so that the paint is cool to the touch. You can also use cotton balls, Q-tips, or paint brushes to move the paint around instead of finger-painting. In the image above, the blended areas were created by finger painting while the white lines within the blended areas were created by a Q-tip. The paint will move in the direction that you pull the paper off, try pulling the paper from a different direction to create a variety of lines for each print. 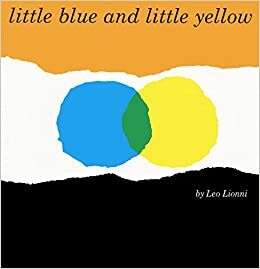 Before or after your mono-printing project, read the book Little Blue and Little Yellow by Leo Lionni together with your little artist. Next Post What is Play Free and Create?